In his extraordinary new book The Things that Matter, Edward Mendelson devotes a few sentences of his introduction to a discussion of pronouns. "A book could be written about the way critics use … pronouns," he comments. There is the "presumptuousness" of the way critics use "we" to suggest like-minded (and therefore right-minded) people; there is "the evasiveness of one"—and, I would add, the implicit universalizing of the critic's own opinions: "One sees in Middlemarch…." But if those tics and strategies are rejected, "That leaves I and you. Parts of this book are written in the second person singular, but that doesn't mean I assume you will agree with everything I say about you, just as I would not assume such a thing if we were talking face to face." One begins this book, then—doesn't one?—a little startled to hear a literary critic so directly acknowledging his own humanity. But it is as a human being addressing other human beings that Mendelson writes. In treating seven novels—Mary Shelley's Frankenstein, Emily Brontë's Wuthering Heights, Charlotte Brontë's Jane Eyre, George Eliot's Middlemarch, and Virginia Woolf's Mrs. Dalloway, To the Lighthouse, and Between the Acts—as explorations of key stages of human life—birth, childhood, growth, marriage, love, parenthood, "the future"—Mendelson assumes that the vast majority of readers of novels over the past two centuries have done well to read fiction in light of their own lives. 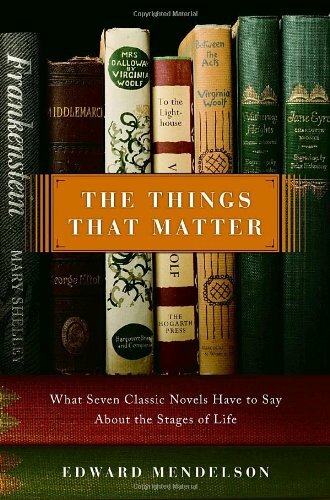 "This is a book about life as it is interpreted by books"; so goes the first sentence of The Things That Matter, and I think it's important to note the boldness of that sentence's main clause: "This is a book about life."